The relationship between two characters (or more, in the case of a polyamorous story such as a love triangle) can be full of intense drama, playful banter, heartwarming intimacy and other interesting elements of human relationships. ‘Hope Anderson is at a crossroads. At thirty-six, she’s been dating her boyfriend, an orthopedic surgeon, for six years. With no wedding plans in sight, and her father recently diagnosed with ALS, she decides to use a week at her family’s cottage in Sunset Beach, North Carolina, to ready the house for sale and mull over some difficult decisions about her future. Tru Walls has never visited North Carolina but is summoned to Sunset Beach by a letter from a man claiming to be his father. A safari guide, born and raised in Zimbabwe, Tru hopes to unravel some of the mysteries surrounding his mother’s early life and recapture memories lost with her death. When the two strangers cross paths, their connection is as electric as it is unfathomable . 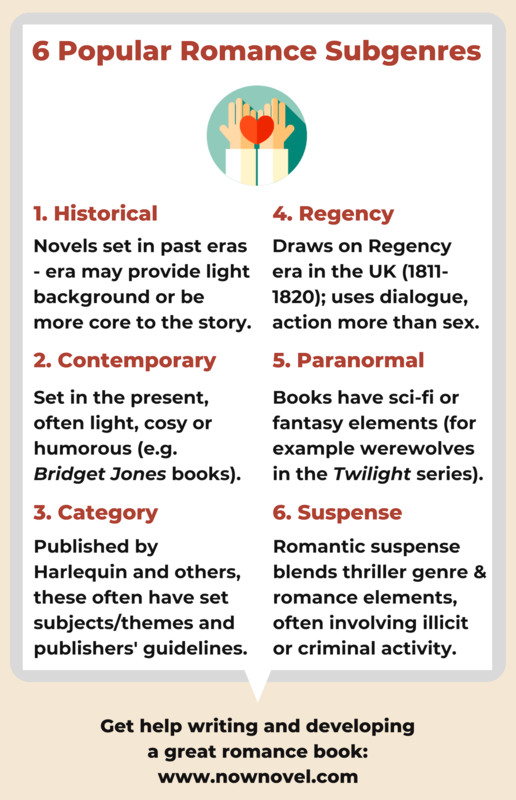 Each of these romance novel ideas contains fodder for interesting parallel plot lines. Center could explore how Margaret’s accident and rehabilitation impact her relationship. Sparks could explore how Hope’s father’s illness and Tru’s search for his own father might affect or deepen their bond. 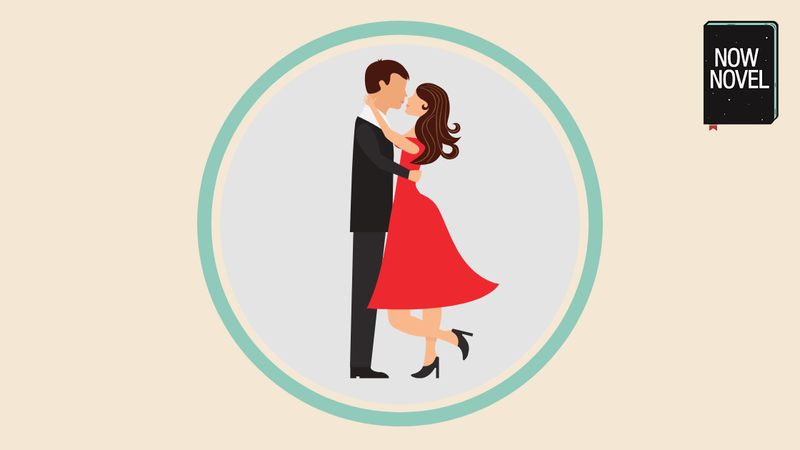 Find a romance plot idea that includes additional parallel challenges, goals and desires for your love interests. This gives characters depth beyond just seeking a mate. Readers get multiple story arcs and unknowns to invest in, too. Sometimes love does come easy. For example, high school sweethearts stay close, marry, and live to old age. Yet relationships that glide along effortlessly are rare. And can make boring reading. It’s the drama, the suspense and tension, that keeps us saying ‘I’m-only-going-to-read-the-next-page-before-bed’. The laughter, in the case of funny romance stories, which is it’s own kind of tension (as we wait on tenterhooks for the punchline). The advantage of outlining your romance story and plotting key details upfront is you have an idea from the outset of possible challenges facing your lovers’ relationship. Many other possible obstacles can make romance plots exciting. For example, lovers being separated by a war, like in Sébastien Japrisot’s A Very Long Engagement (1991) or Nicholas Sparks’ The Notebook (1996). Unavoidable physical distance is a useful device for keeping the question open whether or not lovers will finally be together. Lovers often have goals and complications that work against their union. In Shakespeare’s Romeo and Juliet, the doomed lovers’ feuding families are the complication standing in their way. Goals and complications or worst case scenarios (the worst possible development that could come to pass, the fear lurking in the background) give a story narrative momentum (direction and drive towards the next plot point). For example, in a rags to riches story where a character desires a well-off lover but is also career-driven, part of the story’s momentum may come from the juggle act of balancing romantic desires and professional ones. Maybe a character cancels a date to work late, and the love interest mistakenly reads this as disinterest. There are two main ways to figure out the romantic goals and complications of your romance novel. One way is to outline before you begin writing and the other is to simply begin writing the first draft and see where it takes you. To find the plot points and and character goals that shape your story, use the ‘Central Plot’ section in the Now Novel dashboard. Add ideas to your outline automatically as you go – you can always deviate from your outline as you draft. Yet a useful guide helps to prevent getting stuck. In a gripping romance story, the plot of an entire chapter could revolve around something as simple as one character’s parent coming to stay for a week unexpectedly. In romance stories, plot points revolve around human drama and the complex entanglements of our desires, wants, needs and fears. Milk potential conflicts and misunderstandings to create intrigue and suspense. For example, in Jane Austen’s classic novel Pride and Prejudice, the protagonist Elizabeth Bennett misunderstands her eventual lover Mr. Darcy’s gruff manner for rudeness and disinterest at first. This is a classic love story of two people overcoming the prejudice that results when we rely on assumptions and easy judgments. Familiarity with your sub-genre is important too. Read several books in your genre, be it historical, contemporary or paranormal romance. Take notes on when major plot points occur and what they involve. How far into the story does the first big complication or turning point occur? Try to read in other subgenres (and genres), too. It enriches your author’s palette with many colours. The climax often includes a section where everything appears hopeless and the protagonists’ future together is completely in question. The resolution and reward should be concise – short enough to be satisfying without being drawn out in such a way that romantic and sexual tension fizzle out. Does the above structure sound a little too rigid? The truth is that you should depart from it in any ways that seem logical for your own romance story. Unless you are following strict publisher-given guidelines for a category romance, find the love story you want to tell. 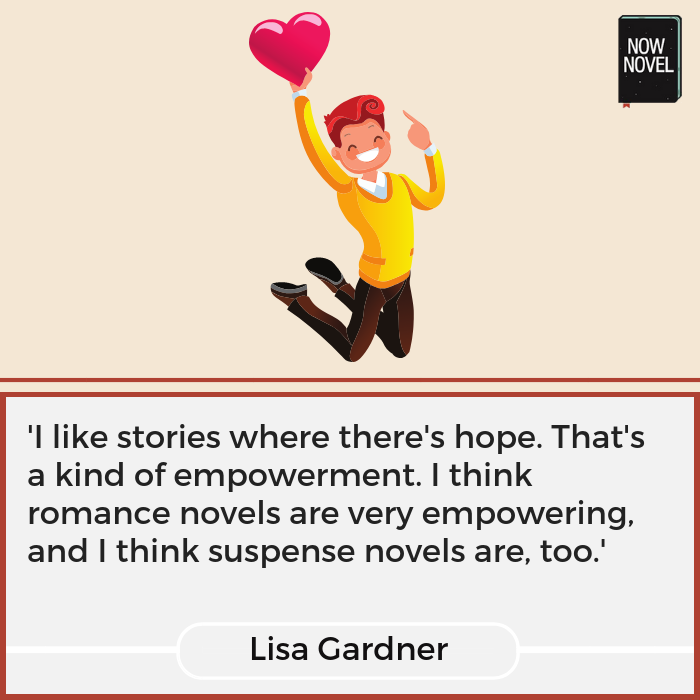 Join Now Novel and get peer feedback or a coach’s help turning your romance story idea into a sizzling novel.